8x50 Straight Through Illuminated Viewfinder with Bracket, Kosmos Scientific de México, S.A. de C.V. The Explore Scientific 8x50 produces a wide 6° field of view and allows precision focus of both main objective and eyepiece illuminated reticle. This finder now includes the NEW long battery life Illuminator II. A precision polished roof prism produces images that are right-side-up, left-to-right correct. In other words, things are not upside-down and backwards like most viewfinders. Our illuminated reticle is truly designed for finding objects with its open center (so you don’t mask the object you are centering with cross hairs) and scale markings for 1.5°, 3°, and 4.5° (the edge of the field of view is the 6° boundary). 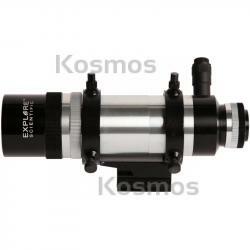 The 55° apparent field, 16mm long eye-relief eyepiece produces a bright 7mm exit pupil and will allow you to find faint galaxies, comets, and nebulae. All optics are EMD Coated to insure maximum contrast. The illuminated reticle of the 8x50 Viewfinder with its scale markings and open center not only helps you center objects precisely, but gives a reference of the exact field of view in degrees. The deep red illumination is continuously variable to provide the desired brightness. Many customers tell us it is the best viewfinder/finderscope they have ever used on their telescopes.